This is a replacement power source for 1.3V mercury cells or other small batteries. It has many uses and I use this circuit in my computer to power a front panel multi adapter which has a digital thermometer. This circuit takes it power from a PC. The power connectors have colour coded wiring, red and black are a 12V supply, black and yellow are a 5V supply. These are extremely high current so absolute care must be taken to avoid short circuits and an inline fuse of 100mA is recommended. 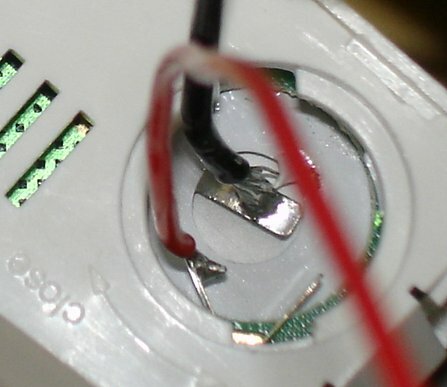 The 1.3V is derived from a Red LED. When on and forward biased the LED's voltage drop between anode and cathode is about 1.9V, this is too high for mercury cell powered equipment, but fed in series with a 1N4148 signal diode drops around 0.6V, the supply is then ideal to drive battery powered peripherals. This is not suitable for clocks, because when the computer is turned off the 5V supply is also switched off. It is however ideal for the independent temperature displays often included with PC preripherals such as case mounted usb connectors. Please note that if you choose to solder connections onto the battery compartment like me it will void the warrantry of your equipment. Do so, only at your own risk. Below is a close up shot of the battery connections. Soldering here requires care, as excess heat will melt the surrounding plastic and you will be working in a small space, typically less than the width of a battery or less than 10mm. Flexible stranded wire is the best to use here. Below is the finished view of my front panel adapter.